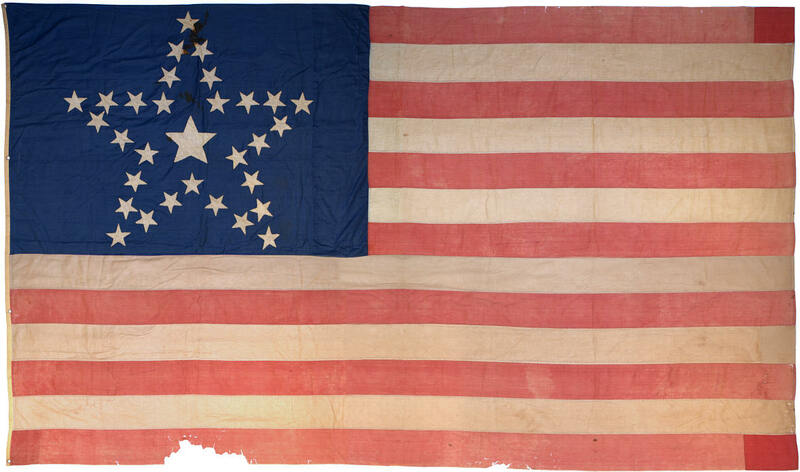 The Grand Luminary or Great Star pattern is one of the most desirable and striking patterns of early American flags. This particular example, made of cotton and hand-sewn, dates to the pre-Civil War era, displaying a complement of 31 stars for California Statehood. Flags that pre-date the Civil War are scare, since Americans typically did not make or fly flags for personal use in large numbers prior to the patriotic outpouring that occurred during and after the war. The use of cotton in the manufacture of flags from the 19th century is typically indicative of a homemade example, since cotton fabric was readily available at the local general store or dry goods retailers. The blue cotton fabric of the canton is a very fine polished cotton fabric, while the cotton fabric of the red and white stripes of the flag is very thin and somewhat fragile. The cotton hoist has four small, finely sewn grommets whip-stitched around metal rings to to reinforce the fabric. the beautiful Great Star on the flag stands straight on the canton and surrounds a single large Center Star, representing California. Although 31 star flags were official for a long period of time--from July 4, 1851 to July 4, 1858--period American flags in the 31 star count are very scarce, with just a handful of examples known. Click here to see a Gallery of Great Star Flags.